And so commences the CSArts-SGV production of “She Kills Monsters,” performed by members of the CSArts Acting conservatory. Set in the late 90s, “She Kills Monsters” is a fast-paced dramatic narrative that defies categorization — simultaneously establishing itself as both an ode to love (in all its forms) and a celebration of individuality, “Dungeons & Dragons” style. “She Kills Monsters” tells the story of “average” Agnes Evans, a cheerleading senior of average height, build, and interests; circumstances that set her apart from her introverted younger sister, Tilly. In the wake of Tilly’s sudden death in a car crash, a grieving Agnes discovers a “Dungeons & Dragons” module, written by her sister under the guise of Tillius the Paladin. Throughout the course of the production Agnes plays out Tilly’s adventure with the aid of dungeon master Chuck, and in time discovers truths about both herself and her sister that she never acknowledged. The show opens up on a minimalist set — a wall of square panels, which are lit with projections of New Landia, with square blocks painted with scenes by the Visual Arts conservatory. On many occasions, actors interact in the aisles running up along the seats, and the open stage space makes way for the dynamic battle scenes that occur throughout the party’s journey. In the role of Agnes Evans is Kiana Taylor (12)∗, who plays a wonderfully relatable lead, jumping from extremes of sadness, sarcasm, and exuberance as she stumbles out of the way of orcs and ogres. Her younger sister, Tilly (Brooklyn Olivas, freshman), acts as a skillful contrast between the two and momentarily exposes a more sensitive side to the dragon-slaying paladin. The pair is joined by the saucy she-devil Lilith (Paulina Padilla, junior) and dark elf Kalliope (Lucie Nortman, senior), both of whom deliver energetic and entertaining performances as opposing members of the party. Alongside them fights the decidedly reluctant Orcus (Brayden Maniago, sophomore), who would really much rather eat Cheese-Whiz than rule the underworld, and an endearingly flustered Chuck (Sullivan Braun-Slavin, sophomore), presiding over them all as Dungeon Master. As the story unfolds, the party faces off against an array of adversaries — disturbingly cheerful succubi, (Reese Oliver and Annika Bolton, sophomores), Miles the Flesh-Eating Jello Mold, who might not actually be Agnes’s football jock boyfriend (Tammuz Lee, 11), and the bloodthirsty forest guardian Farrah (Annika Bolton). However, “Dungeons & Dragons” would not be D&D if not for the dungeons or its dragons, and in this case the special effects of “She Kills Monsters” was just as much a performance as the battle choreography and dialogue. 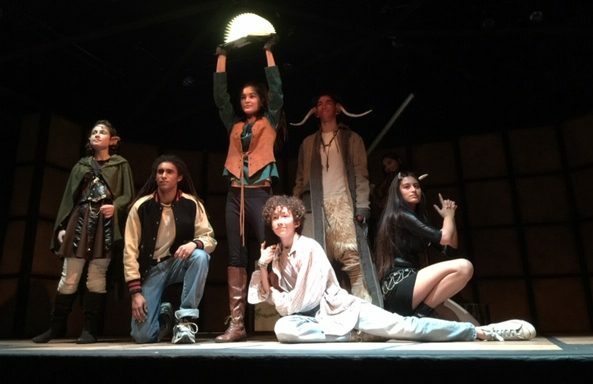 The students of the CSArts Production and Design Conservatory were responsible for much of the set, costume, prop, and tech design onstage, an undertaking that often carried them into extensive rehearsals just as exhausting as any actor’s. “We design cues and how we want the scenes to look. When we do a full run-through it keeps the world consistent,” head of lighting Jenny Austin said. Despite their work, Production and Design doesn’t often get the credit it deserves, however, part of the magic of “She Kills Monsters” lies in the intensity of its atmosphere and the involvement of both the set and crew. Part of the quest the party embarks on involves battle with Tiamat, a five-headed dragon, and the ensuing display owes much of its grandeur to skillful lighting and some very clever prop work. It is sometimes imagined that a show must be a competition — who outshines who, and who has a bigger role, both on and off the stage, but the production of “She Kills Monsters” stands as proof of teamwork, both in its story and the efforts of those who made it possible. Shows run from Jan. 23 to 26 at the Sierra Madre Playhouse. Tickets can be purchased here. ∗The show covered in this article features Cast A. The show runs on two casts who play their respective roles on alternating showings. There is no difference between the two other than a considerable age gap. Cast 1 features mostly middle school/freshman students while Cast A features older students.